Pad is upholstered with pvc leather in cream color and is a cushy 2" thick. No deep scratches, no cracks or broken parts. Thickness of acrylic: 0.75". 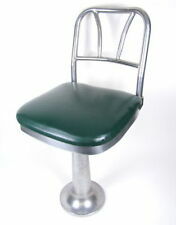 Mid Century Soda Fountain Drug Store Stool Top. NO BASE. 12.5" wide 3.5" Deep. Steel Stem Accepts 1.75" base by 1.5" deep. This is Vintage, Has Flaws on Original Red Top. 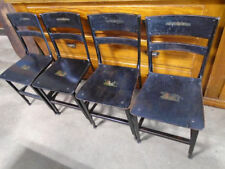 Art Deco Ribbed Side is in good shape *See Pics*.... Email questions and check out my other top auction. This is an elegant bench, and I believe the style is French. We do not know its exact age. This is a quality piece of furniture. We took these photos outside on our porch. This ottoman has a great shape and is very study. This is a quite old oak piano stool with ornate legs and base and glass ball and claw feet. The round seat is adjustable. It's about 19.5" high at its lowest point and can be turned to raise higher. This Bench is very Old but still in Good Condition. This piece appears more of a decorative piece. This is what gives it its character and confirms its age. FREE Trial! We can arrange for pickup with your carrier. Wear is usual for its age. This is what gives it its character and confirms its age. Unique Bench also known as a Savonrola X Bench or Dante Bench. The Bench features a unique X design with a very thick vinyl woven seat AND decorative. Plus is is made from solid wood with decorative features. I have this spectacular Victorian Vanity/Bench up for sale; c1800s. It is covered in a Maroon colored velvet with fringe around the edge. The Mahogany wood design has a great detailed wood skirt that is quite beautiful – Look closely at all the photos to see the real beauty of this Vanity bench. Solid and Firm. Overall a Very Unique Bench that you will highlight any room that it is placed in! The Leather has a few snags on the side and the Finish is Worn. They may be original, or reproduction, or the style of, or made by. They may be original, or reproduction, or the style of, or made by. And including a variety of reasons. They could use a good cleaning. Otherwise Wear is usual for their age. They are Solid and Firm. Solid and Firm. Los Angeles Area (Santa Ana, CA 92705). They may be original, or reproduction, or the style of, or made by. And including a variety of reasons. FREE Trial! Chippendale Style. Hand Done Needlepoint. Solid Mahogany. Normal minor signs of use or wear may be present, such as minor nicks, dings or light rubs. Our newest location, Stenella Interiors is a 24,000 sq ft, beautifully arranged showroom located in Lansdale Pennsylvania. Stool is very sturdy and strong with no defects. They may be original, or reproduction, or the style of, or made by. And including a variety of reasons. Rubbed Distressed Finish in an off white Beige color. Los Angeles Area (Santa Ana, CA 92705). THE STOOL IS IN GREAT CONDITION WITH JUST A FEW MINOR SCRATCHES FROM PREVIOUS USAGE. THE STOOL IS STAMPED ON UNDERSIDE. Stool Ottoman Bench Seat Chair. 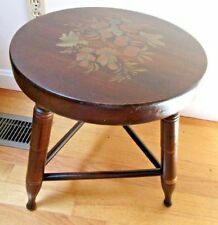 THIS STOOL IS AN INCREDIBLE PIECE FOR ANY COLLECTOR! UNIQUE BENCH in Good Antique Condition. Solid and Firm. Overall a Unique Bench that will high light any room it is placed in. This is what gives it its character and confirms its age. They may be original, or reproduction, or the style of, or made by. Original pink upholstery over well made base. Piece has no odors and the foam is excellent. Piece is in the style of Jonathan Adler. 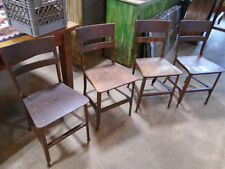 Jessup Furniture Corp. Victorian Style Pair of Turned Leg Stools. STYLE: Victorian. Antique Holtzman Adjustable Mahogany Piano Organ Stool w/ Ball & Claw Feet - 1900's. Shipped with USPS Priority Mail. This piece offers so much character and would be perfect in the right setting. It does have flaws due to its age, but doesn’t hurt its durability. This stool is very sturdy. See pics for any “Beauty blemishes”. Ask all questions before placing a bid due to the fact I don’t accept returns. However, I want you completely satisfied. Thanks for taking a peak and Happy Bidding! TAPESTRY FABRIC. CONDITION LISTED IN CONDITION SECTION. NO RESERVE. IF YOU ARE A DEALER A RESALE CERTIFICATE NUMBER MUST BE ON FILE WITH SIGNATURE. ANTIQUES & COLLECTIBLES OVER A CERTAIN AGE ARE NOT NEW AND YOU SHOULD EXPECT IT NOT TO BE. Be sure to let us know that you are planning your pickup. More than just a pretty picture. This beautiful Art Deco stool / vanity bench is in good condition, with an upholstered seat. The stool is crafted in the wonderful Art Deco style, and is made out of wood, solid wood, walnut wood, veneer, and upholstery. 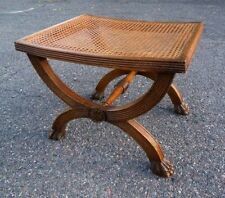 Item : Small Antique Colonial Solid Walnut Footstool withTurn Carved Legs. Condition :Very good antique condition being structurally sound with age appropriate signs of normal use as pictured. Overall very nice. This is what gives it its character and confirms its age. We can arrange for pickup with your carrier. with normal use. Our goal is to always provide you with the highest level of service. We will get back to you quickly. We are part of Rods Rustics LLC. I believe this was produced around or a bit before the turn of the last century. It is about 20 1/2" high. 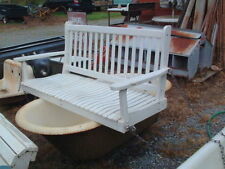 This bench is in excellent antique condition, showing only minimal signs of use. The upholstery is immaculate, showing no tears or stains or even wear.